Insects are arthropods with three body sections (head, thorax, and abdomen), six legs, one pair of antennae, and usually one or two pairs of wings. An insect's thorax (midsection) is the section to which wings and legs are attached. The abdomen contains many of the insect's internal organs. Insects usually have two large compound eyes, which contain many lenses. Most insects also have small simple eyes, which can distinguish between light and darkness. Insects obtain oxygen through a system of tubes. Air enters the insect's body through these tubes and travels directly to the insect's body cells. Insects begin life as tiny, hard-shelled, fertilized eggs. After they hatch, insects begin a process of metamorphosis. 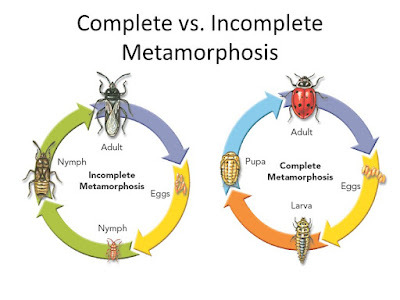 Each insect species undergoes one of two different types of metamorphosis. Complete metamorphosis (beetles, butterflies, houseflies, ants) - four different stages: egg, larva, pupa, and adult. Larvae are specialized for eating and growing. During the pupal stage, the insect is enclosed in a protective covering and gradually changes from larva to an adult. When it has completed its development, an adult insect emerges from the pupa. Gradual metamorphosis (grasshoppers, termites, cockroaches, dragonflies) - has no distinctly different larval stage - an egg hatches into a stage called a nymph, which often resembles the adult insect. A nymph may molt several times before becoming an adult. Insects have many defenses against predators such as: hard exoskeletons, run quickly or fly away from danger, smell or taste bad to predators, painful stings, camouflage, resemblance to different animals.